Following our most recent retreat in Bali we had two choices: Return to Thailand to relax during the build up to our next retreat in Koh Samui, or head to Sri Lanka for a few weeks to get on the ground to do some recon work so that we can get Sri Lanka live as soon as possible (Tough choice I know!). Neither of us had previously been to Sri Lanka, and although we'd done our research and knew there was some amazing things to do there, we figured if we're going to actually take people to a country it might be a good idea to go there first. So that was it. Decision made. 48hrs later we were sitting on a Sri Lankan Airlines flight to Colombo and boy were we excited! Not only for the fact that we splashed out on Business Class tickets (I got a good deal, before you all think I've got too much money! ), but that once again we were doing what we do best - Exploring! It was before even leaving the airport that we experienced something pretty unique to Sri Lanka, or at least something that we've never seen it anywhere else in the world before - The duty free is like none other! The usual expectation of jumbo sized chocolate bars, cartons of cheap cigarettes, and an equal ratio of booze to cologne on the shelves was modest at best. Instead we were surprised to see shop after shop selling the one thing nobody should leave the airport without…………household appliances! Seriously, I'm not talking small items like kettles and toasters that you can chuck on the back seat of a taxi. I'm talking fridges, washing machines, tumble dryers, basically think of the largest appliances you possible can and that's what was on offer at Colombo Airport. Sufficed to say we left empty handed. It didn't take long to experience surprise number 2. As we walked through the sliding doors and out into the public area of the airport we braced ourselves for the usual barrage of desperate taxi drivers shouting frantically to get the fair they've been waiting all day for. Instead we were greeted with silence. An orderly gathering of pre-booked drivers holding up signs with names scrawled on them and a handful of private taxi company booths that have likely paid a considerable amount of money to be given priority over arriving passengers. We approached a booth, we're shown a price list, and were subsequently escorted to a waiting car outside. Well that was easy! The next stage of our trip was to make the journey from Colombo, down to the South Coast where we planned to host our retreat. There are quick and efficient ways to make this journey by paying a taxi to drive you the 120KM, but we decided on a more "local" way of travel and took the train. If you want to experience real Sri Lanka then train is a great way to do so, however just be prepared that this is a local commuter train and will be rail travel in it's rawest form. Forget nice, comfortable, air conditioned carriages, and instead expect to be stood for a majority of the 3hr journey next to an open door exposed to the true Sri Lankan countryside as it zooms past in all of it's glory. It's a beautiful, yet uncomfortable experience. One that is absolutely worth experiencing, but not one you will feel the need to do twice. Surfing is a big part of why Sri Lanka has grown in popularity in recent years, and was a definite possibility for our retreat. It's an absolutely awesome way to get people active, and most importantly it's really, really fun! So first stop - A surf camp. We stayed with an awesome camp for a few days to see how we could potentially incorporate the things that they do, with what we already do. Apart from being a really great way to experience first hand the type of surf conditions our guests might expect, It was also a great way to brush up on my skills a little by taking advantage of their generous offer of free lessons. If 3 days swallowing my own bodyweight in sea water wasn't quite enough, we still had a lot of ground to cover and a lot more awesome activities to test out. SUP Yoga is something we have discussed several times before, and to discover that there is a school that does it just a stones throw from our desired location was a clear sign to us that we had to try it out. Yoga is something that doesn't quite come naturally to me. Having spent the last decade lifting weights and paying little attention to flexibility means that my downward dog resembles more an Ostrich burying it's head in the sand, and my tree pose is more oddly shaped rock pose, so the thought of attempting Yoga on a narrow floating board was both amusing to me and mildly concerning. My concerns however were put to rest when I discovered that I was either much better at Yoga than I thought, or the more likely scenario that SUP Yoga really was suitable for even the clumsiest would-be Yogi. Although the Ozzies may not agree, we brits have discovered that beaches can be used for other activities other than surfing! Seriously, I'm not joking. There's this thing that we're basically experts at, where we wear as low SPF suncream as humanly possible and we lay very, very still for several hours, moving only to take another sip from our Mojito, or possibly to call the waiter so we can order another Mojito. Occasionally we will walk awkwardly across the hot sand to go and stand in the sea, not really doing anything, just kind of standing there and looking around for a few minutes. We'll then hobble back across the sand to our sunbed to continue the ritual, only this time we've washed off what little suncream we had on in the first place just to ensure that we get as deep sun burn as possible. The objective is to get as burnt as possible, as fast as possible, so by the time we go home we've shed whatever skin colour we may have had and co-workers say "I thought you went on holiday". 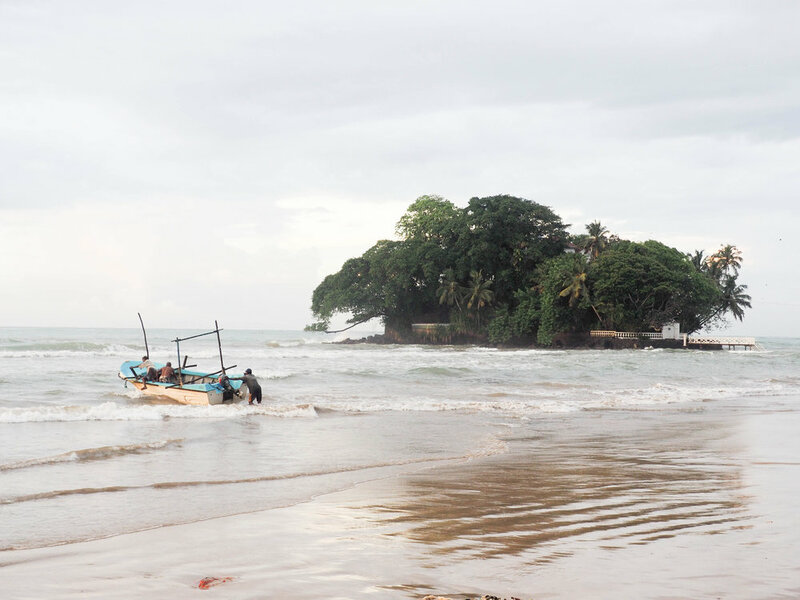 But seriously though, Sri Lanka isn't just about surfing and National Parks. It's home to some absolutely stunning coast line and the most pristine white sandy beaches, so if it's a beach holiday you're after we've got you covered. Now obviously our time was limited, so as much as we would have loved to, there was no way we would be able to try ALL the awesome activities on our list, but we definitely wanted to get out on a Safari to see some wildlife. We even got to just a few hours before our 2am pickup (yes if you want to see the sunrise over the Yala National park you've gotta leave at 2am!). It was only upon organising the final few details of the pickup that I happened to mention that Ina was pregnant, which subsequently threw a spanner in the works when the company reminded us that a whole day driving through a National Reserve, in an open top Jeep under the blazing sunshine might be considered somewhat…………….well let's say it like it is, stupid! So in the interests of safety, we unfortunately decided to cancel the trip and add it to the growing list of potential activities for our guests next August. That really is just to name a few, and unfortunately Sri Lanka is such a huge, diverse Country that there's just no way we'd be able to get round every cool activity on offer in the space of a week. That's why we absolutely advise that guests extend their stay and explore this beautiful Country following the retreat. No matter what activities make the final cut we will have a comprehensive list for guests to choose from and be helping them continue their journeys should they wish to do so. Sadly our time was up and so we wrapped up our visit to Sri Lanka, but man did we leave feeling super excited about next April, and what we really believe is set to be the ultimate active escape. Register you interest to be one of the first to book!